This New Puzzle Set for the Penny Dell Crosswords App Is Making Me Hungry! Hello puzzlers and PuzzleNationers! Yes, we’ve got a second bonus blog post for you today, because there’s simply too much great stuff to announce today! It’s the Breakfast Deluxe Puzzle Set! Start your mornings right with a hearty breakfast and some terrific crossword puzzles, courtesy of your friendly neighborhood constructors at PuzzleNation! 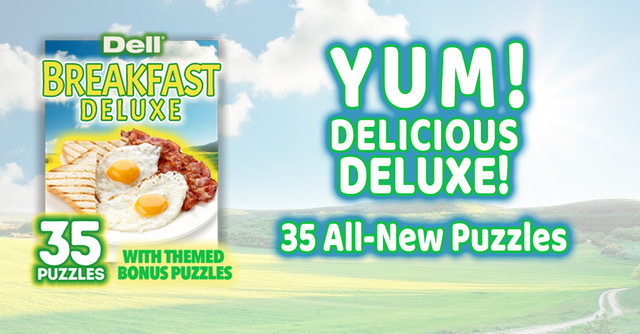 Offering 30 easy, medium, and hard puzzles, plus 5 breakfast-themed bonus puzzles to sate your puzzly appetite, no matter what your skill level, the Breakfast Deluxe puzzle set is part of a well-balanced day of solving! Plus it’s available for both iOS and Android users!